Prior to the 2018 season getting underway, Swans forward Kurt Tippett announced his retirement after a number of injury setbacks. Having made an inspirational comeback to the AFL level from five knee reconstructions, 2012 premiership player Alex Johnson was delisted after he cruelly ruptured his anterior cruciate ligament again a week after his return. Dan Robinson, Harry Marsh, Jordan Foote and Dean Towers were also axed after a combined 113 games, as were untried rookies Angus Styles and Jake Brown. At the national draft Sydney did some shrewd live trading to secure academy prospect Nick Blakey without giving up a second-round selection. With that pick the Swans chose James Rowbottom from the Oakleigh Chargers, with fellow TAC Cup products Justin McInerney and Zac Foot also joining the club. With Robbie Fox upgraded to the senior list, the Swans had two rookie spots open, which they used on Durak Tucker from Peel Thunder and Harry Reynolds of the Sandringham Dragons. Next Generation Academy player Samuel Wicks became part of the club via the category B rookie list. After two years of Josh Kennedy being skipper of the club, the Swans made the decision to anoint Luke Parker and Dane Rampe to co-captaincy alongside Kennedy, a nod to the leadership model Sydney have been known for. Coming off the fourth Coleman Medal of a glittering career, champion goalkicker Lance Franklin started his 14th season with a bang, booting eight goals against eventual premiers West Coast in the opening round. However, that match, played at the new Optus Stadium in Perth, would contribute to a heel injury that would see Franklin struggle to train all season and miss games between rounds 6 and 8. Still, Franklin managed 57 goals, and in a nod to his everlasting impact on the game he was named captain of the All Australian side, his eighth appearance in the team. The soon-to-be 32-year-old will be smarting after a poor showing in Sydney’s elimination final against the GWS Giants and will be looking to rebound in a big way and win his first premiership as a Swan. Will 2019 be the year that Franklin joins the company of Tony Lockett, Gordon Coventry, Jason Dunstall, Doug Wade and Gary Ablett as the only players to kick 1000 goals in the history of the game? For the second time in three years Sam Reid endured a wretched campaign that limited him to just one solitary match, robbing Sydney of a quality second tall in attack. In his single match of 2018 he suffered a quad tendon injury before injuring his Achilles in the NEAFL once he returned to full fitness. Reid battled an unsuccessful race against the clock to return in time for Sydney’s premiership push, and the Swans will be boosted by his return in 2019. So impressive was Matthew Ling’s opening few months as a Swan, the Geelong Falcons product was offered an extra season on top of his initial two-year contract. Drafted at pick 14, Ling managed six games in the NEAFL before a broken toe ended his year. With the Sydney midfield requiring an injection of speed, Ling’s blistering pace and great endurance will be outstanding qualities for John Longmire and the coaching staff to utilise. One of Sydney’s best performers in the NEAFL, James Rose has struggled to maintain that good form when given an opportunity at senior level. After booting 46 goals in 2017, Rose enjoyed more midfield minutes last year, averaging 23.8 disposals in 13 games, including 35 possessions and 15 clearances in the Swans’ grand final loss to the Southport Sharks. However, Rose managed only one AFL match, making it two games in two years. Out-of-contract at the end of the season, Rose will be desperate to add to his nine senior-level appearances. Despite managing 34 games from the last two seasons at North Melbourne, Ryan Clarke found himself close to being delisted after a heavy recruiting drive from the Kangaroos. Instead the Swans came knocking, offering the Roos pick 62 for the young midfielder. A great endurance runner, Clarke can find the ball but at times lacks smarts. If he can be more damaging with the footy, Sydney will have a winner. Having made a return from nearly four years on the sidelines due to knee injuries, Daniel Menzel was one of Geelong’s most lethal goalkickers, booting 100 majors from his last 50 games. However, injuries again plagued Menzel’s last year, with a groin complaint seeing him miss nine matches. Following Geelong’s exit from the first week of the finals, Menzel was axed by the Cats. The Swans swooped, picking up the talented goalkicker as a delisted free agent. Having undergone groin surgery, Menzel will have to prove his fitness before being considered for the best 22, but a forward line consisting of him and Franklin will be one to watch. Joining Menzel at Sydney is fellow ex-Cat Jackson Thurlow after 46 games in the blue and white hoops. Originally first-round draft selection, Thurlow struggled to impose himself in the Geelong back half and moves to the Swans looking to ignite his career. 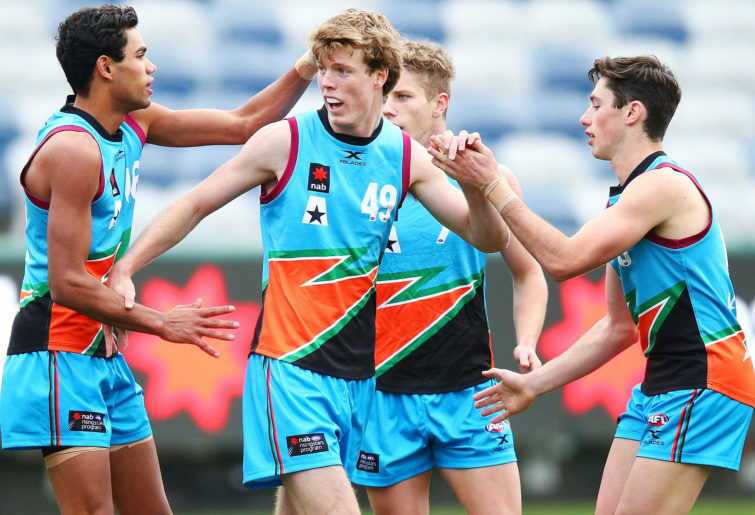 Eligible to join the Brisbane Lions and North Melbourne as a father-son recruit, Nick Blakey instead decided to become a Swan as a member of their Next Generation Academy. Son of 359-game veteran John, Blakey is, unlike his father, a rangy, athletic forward standing at 195 centimetres. With great endurance, Blakey can also push up into the midfield, where his great left foot kick can be used to great effect. If Blakey goes on to have the career that many expect he will, spare a thought for the Kangaroos and Lions supporters. A key component to any successful Supercoach side is a gun defender who scores triple figures for the majority of the season. In terms of averages, Sydney’s Jake Lloyd was the best defender across the league, going at a very impressive 112 point per game in 2018. However, if you ignore Lloyd’s first seven games of last year, which were still impressive, he went at an average of 122.4 points per match, unreal numbers for a former rookie selection. If you’re looking for someone a little more experienced and trustworthy, Swans co-skipper Josh Kennedy should be relatively cheap considering his average dipped below 100 points per game for the first time since 2011. The Swans have received a very strong fixture, with some terrific home matches set to deliver some sell-out crowds at the SCG in 2019. Sydney kick off their campaign with a 2016 grand final rematch against the Western Bulldogs at Marvel Stadium, which will be one of three matches played under the roof for the year, with all of them coming in the first five weeks of the season. Sydney will also play two games at the MCG and one match down the highway at Geelong. For the third time in their history the Swans will play in Hobart. They also play one game each in Perth, Adelaide and Brisbane. Along with their 11 home games, the Swans will venture out west to play at Sydney Showground Stadium against crosstown rivals GWS. The Giants are one of five teams Sydney will meet twice in 2019, with Melbourne, Geelong, Essendon and Carlton also to face the Swans on two occasions. Commercially, Sydney will play six matches in a marquee timeslot, with one Thursday night blockbuster against Melbourne along with six Friday night games, four of them at the SCG. For the first time in more than three years Sydney will take on Carlton under the roof at Marvel Stadium in Round 3, while the Swans take on Essendon at the MCG in Round 16 for the first time since the 2004 season. The brilliant career of Lance ‘Buddy’ Franklin will be celebrated in earnest this year when he, if the stars align, runs out for his 300th match in Round 10 against Collingwood at the SCG, fittingly the opening match of Sir Doug Nicholls Indigenous Round. Arguably the greatest player of the modern era, a capacity crowd will get through the gates for this Friday night blockbuster. The last two games between Sydney and Collingwood have been nailbiters, decided by one and two points each. It seems so out of place that Sydney, one of the most formidable and hard-to-beat teams in the league, has such a poor recent record at their home ground the SCG. In 2018 the Swans won just five matches from 12 played at home, posting their lowest-ever score at the venue in their elimination final against the GWS Giants. In Round 14 the Swans will take on fierce rivals Hawthorn in a Friday night encounter at the SCG, when they’ll hope to break a seven-year, five-game losing streak against the Hawks at their home venue. I find the Swans very similar to Geelong in the sense that they are a very good, hardened team capable of posting the required number of wins to make the finals year after year but haven’t got that next level in their game to actually make an impact in September. That may be harsh considering the Swans have played off in two of the last five deciders, but John Longmire will be hoping that the legacy he leaves behind as coach is more than that of someone who jagged a premiership early in his career but then couldn’t reach the top of the mountain again, something staring Cats coach Chris Scott in the face. For that not to happen Longmire needs to be more proactive in the coaches box and some of his players need to be kept in their preferred position. Ben Ronke and Tom Papley are gun small forwards and should, quite frankly, never leave the forward line unless they absolutely have to. With more development from the likes of Oliver Florent and Will Hayward, combined with the return of Callum Mills, Sydney are well-placed to make a good fist of 2019. Transforming the SCG back into a fortress is a must. Predicted finish: Sixth to tenth.